Unchecked use of drones is counterproductive, says the retired Marine general who is close to Obama. 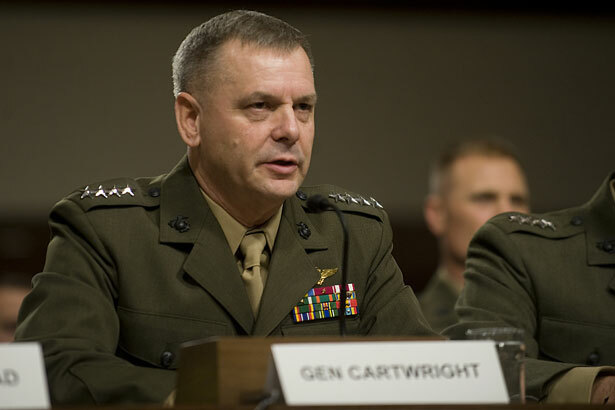 Retired four-star Marine General James Cartwright, who’s been close to President Obama for years—hawkish critics called him “Obama’s general”—has spoken out forcefully against the unchecked use of drones. According to the general, who’s been a long-time skeptic of the war in Afghanistan, drones cause anger, bitterness and resentment among Muslim populations targeted in the attacks, and he suggested that their use will cause “blowback,” i.e., attacks against the United States. Cartwright also said that he wasn’t enthused about the idea of shifting responsibility for drone warfare from the CIA to the military. Recently, the Obama administration has been hinting that it intends to have drone warfare brought under the Pentagon’s control, at least in places such as Yemen—though not, apparently, in Pakistan, where the vast majority of drone strikes take place. But Cartwright said that he’s concerned that there would be a “blurring of the line” if the military takes control of what is essentially a covert program to wage war in countries where the United States is not technically at war. If the drones are placed more fully under Pentagon control, they’d be under the purview of the super-secret Special Operations Command, which has become a kind of “mini-CIA” inside the Department of Defense. Perhaps because of his unorthodox views, Cartwright lost a chance to be named chairman of the Joint Chiefs of Staff, and Obama picked General Martin Dempsey instead—even though Obama and Cartwright were close. How sincere was Republican support for Rand Paul's filibuster against drones, Rick Perlstein asks.